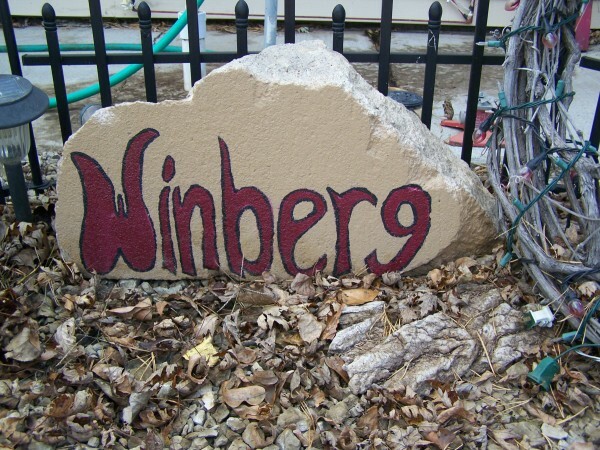 Use either a large stone or even a slab of concrete to create a unique welcome sign for your garden or drive, incorporating your last name into the design. 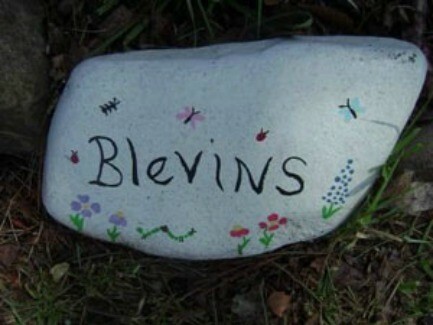 This is a guide about how to paint a last name yard rock. A new way to use rocks. Take a big smooth rock and clean it well, let dry. If the rock is dark, use light colored paints, if light, use dark paints. 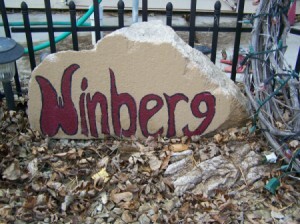 You could also paint the whole rock one color, but make sure it is dry before painting on the design. Then you can paint on anything you want. I chose to put our last name on ours, but you can put any thing you like. Paint flowers or other designs around the words. When paint is dry spray with sealer. Hi guys. Sorry it took so long to respond but my computer has been torn up. Make a quick house warming gift that will last for years. Spread newspaper out to cover your working surface. With a steel brush clean the surface of your cement for all loose chunks then use a brush or water pressure to remove all dust. Let it dry completely before covering with cement sealer. Let the sealer dry and then trace on your letters, paint with oil base paint two coats letting them dry in between. I prefer to use spray paint so I make a template of my letters. Remember to keep the centers of letters such as A, O, P and tape them onto the cement before you paint. I wear rubber gloves and hold the edges of the centers down with my gloved finger while spraying as it is hard to get them to stay in place. Using stick glue will work if you are careful also. Make sure you spray straight at your rock or you will have spray bleed under your edges. Some bleeding can and will be covered by outlining all of your letters with a complementary color of paint with a small brush after your main color is dry. This looks good anyway to me as it really sets the letters off. I have several rocks I made 10 years ago and they still look like the day I made them. If you don't use the cement sealer your paint will not stay on the cement for long before it starts flaking, so be sure to use it.